There is a snake loose in our nation, a twisting serpent spirit that's trying to twist everything President Trump says or does. It is a battle between darkness and light, and we must pray, Church, for the President that we elected. All hell is in a rage. They scream! They scheme! They cannot stand that Trump won this election and God put His chosen man in place. 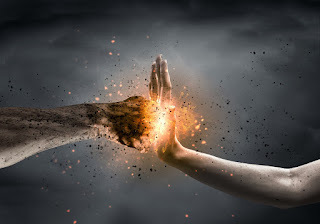 They pound their fists against the light, enraged the more that they cannot pound it into dust. But they cannot. Pray! Pray hard, Church. Declare the opposite of what you see. Release truth, and peace, and mercy into our land. Pray protection for our President. Pray wisdom to be given him. Pray that God surrounds him with Daniels and with Josephs. Pray especially for his life and that angels surround him to keep him safe from harm. Cry out! For a great battle is upon us and we must stand and halt the dark.